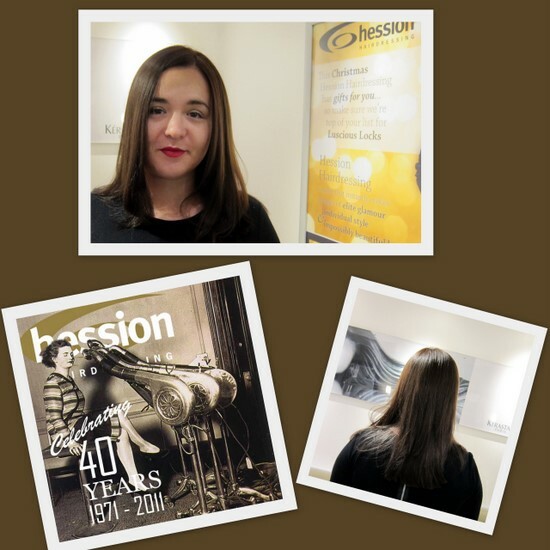 Hession Hairdressing celebrate their 40th anniversary this year. Founded in 1971, this Irish family business has become something of a Dublin institution and now has two salons, in Drumcondra and Clontarf. Hession's work is regularly featured in magazines and on TV so I was thrilled to be invited along to experience the flagship salon in Drumcondra. Hession offers all of the latest hair treatments; one of their newest offerings is the deluxe infusion blow dry by Collexia*, which treats hair while drying it in almost half the standard time. Kate Middleton is said to be a fan of the treatment, which is infused with Keratin, silk proteins and multivitamins to leave hair shiny, nourished and restored. I didn't try the deluxe infusion blow dry on this occasion but went for a cut and an all-over colour to tidy up my tresses for the Christmas holiday. I was looked after by Yvonne for both, a lovely and talented Galwegian sporting a super chic auburn bob that gave me a serious case of hair envy! The Hession experience is lovely. All the usual touches are provided, from the much welcome cappucino to the selection of up-to-date Irish and international magazines, along with a few that aren't so usual - like the vibrating massage chairs at the basins. Yvonne spent a lot of time chatting to me to find out exactly what I was looking for from my colour, and I was delighted with the results. My hair had been looking very flat and dull but is now shiny and healthy. The colour is natural but much more multi dimensional. You'll find Hession Hairdressing at 108 Upper Drumcondra Road, Drumcondra, Dublin 9 (tel 01 8376265) and at 4 Vernon Avenue, Clontarf, Dublin 3 (tel 01 8330110). You can also book online at www.hessionhairdressing.ie. *The Deluxe Infusion Blow Dry is €35 at Hession Hairdressing. Your hair looks fab Emma! I've been meaning to pop into the Hession in Clontarf after they won the Young Colourist Awards at this year's L'Oreal Colour Trophy Awards. Totally going to try that Deluxe Infusion Blow Dry over Christmas! Ah thanks ladies, I was delighted with the whole experience, can highly recommend! A good blow out makes everyone feel better doesn't it? It definitely does Johanna, they should be given out free for medical reasons!